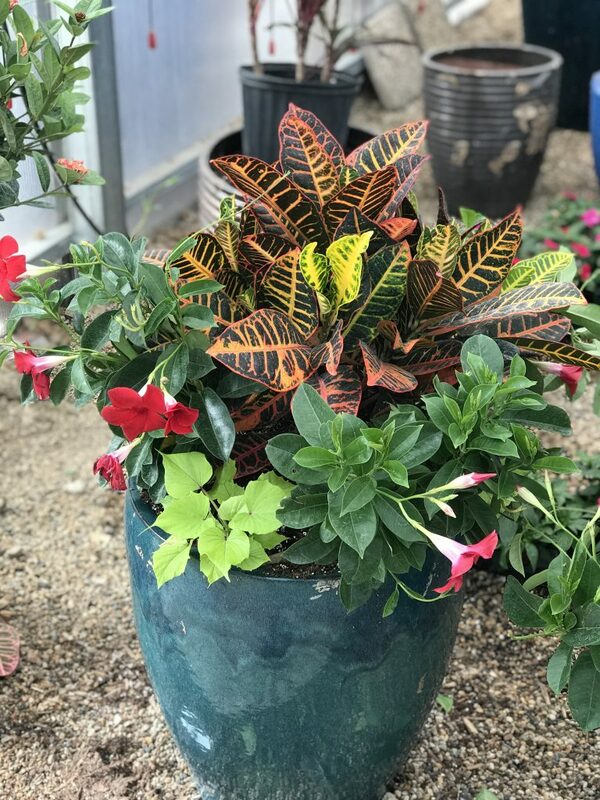 Vibrant buds blossom out of colorful planters and baskets located throughout the greenhouses at Ferguson’s Garden Center. With planting season right around the corner, Ferguson’s has been preparing for its fellow garden lovers since last year. On February 22, the staff enjoyed digging in the soil and planted succulents, mezoo, and petunia hanging baskets. The colorful geranium flowers were planted the following week in preparation for spring planting. Over 3,000 pots began arriving soon after, and 4-inch plants were planted in mid-March. 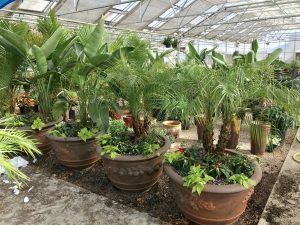 By the beginning of April, Ferguson’s greenhouses are a blossoming haven for gardeners looking to spruce up their gardens and yards. Quance’s father, Ken Ferguson, started Ferguson’s Landscape in 1976, with a plan to do some small planting jobs and sod a few lawns. The Iowa Great Lakes embraced his work, and Ken moved the business to its present location in 1980, along Hwy 71 in Spirit Lake. 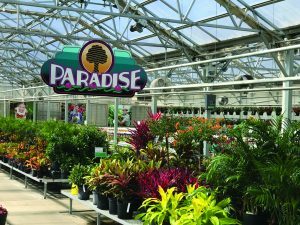 The landscape business expanded to include a garden center, along with numerous greenhouses and a nursery. 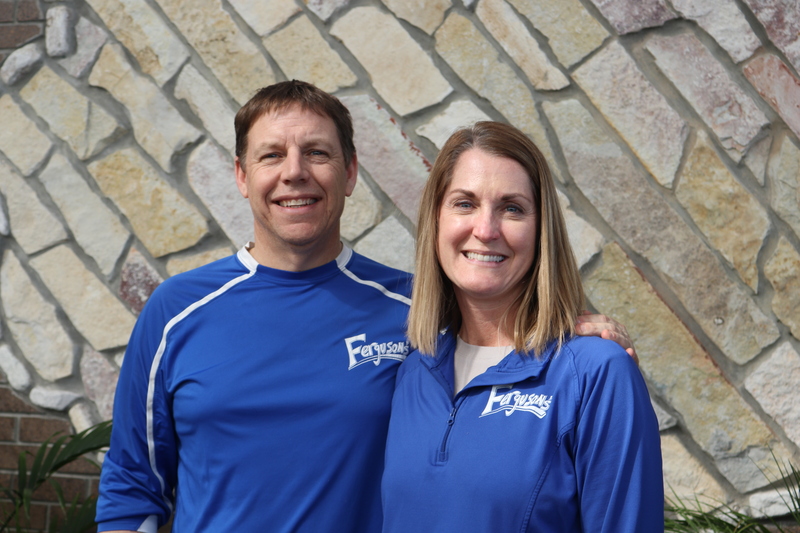 In Nov. 2007, Chris and Renee purchased the retail portion of Ferguson Landscape from her parents and named it Ferguson’s Garden Center. Ken continues to work in the landscape side of the business with his son Ryan. Ferguson’s Garden Center has eight year-round staff and employs 20 staff members during the spring and summer months. The gardening experts at Ferguson’s Garden Center are always available to help with gardening, planting, and floral needs. 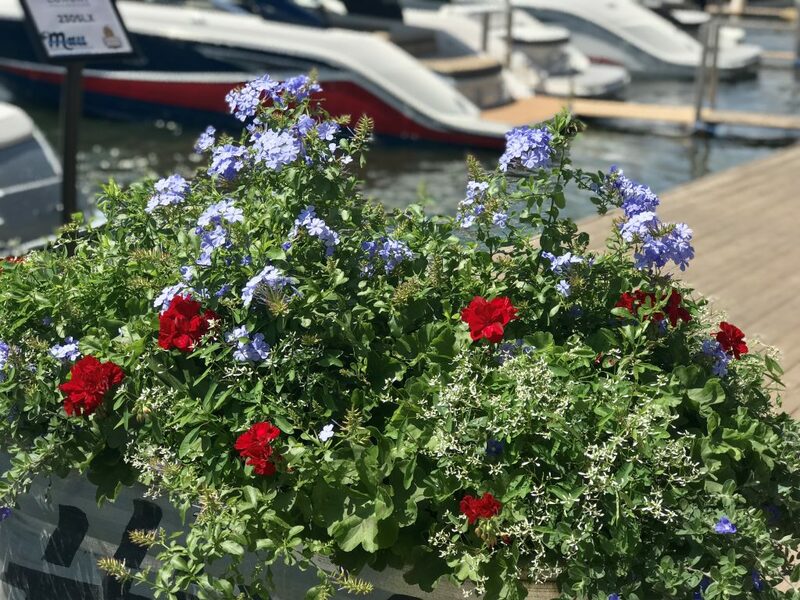 The blue team has a wide variety of tools and plants available to fit their customers’ needs, whether it’s flowers, plants, trees, pots, gardening supplies, outdoor patio furniture, watering supplies, or floral arrangements from the full-service floral shop. One of Ferguson’s gardening experts, Sue Shupe, is always excited to answer a question or help a customer find just the right thing.Every year, Shupe will plant over 500 custom planters. 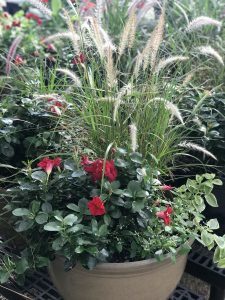 When choosing items for planters, Shupe says to consider where the planter will be placed. Ask questions like: how much sunlight will it receive and how often will it be watered. “Will you only look at it once a week and still want it to be beautiful or are you a fiddler,” she said. Dependent on sunlight and watering, first select thriller plants. These are the plants in the middle and often are large tropical plants. 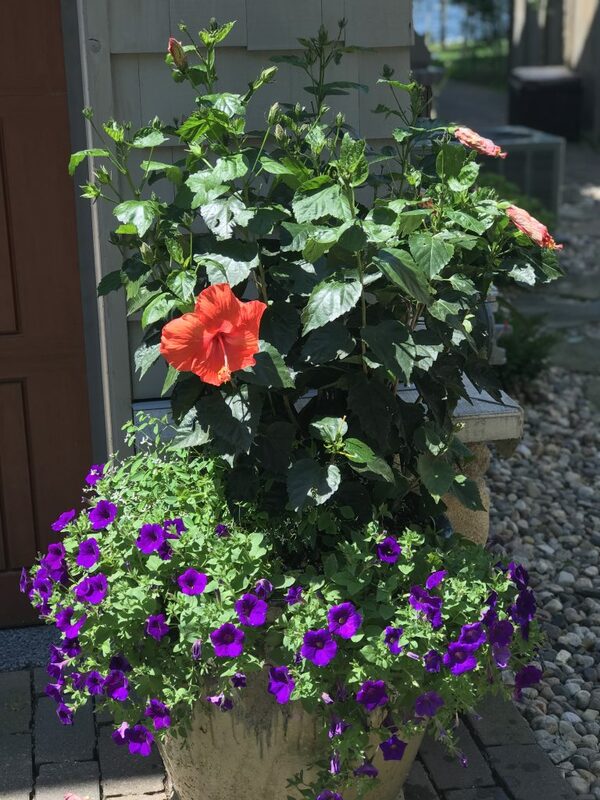 Next, choose filler plants, which usually are smaller colorful plants that fill together for color. Lastly, pick spiller plants that will drape over the outside. The plants will fill together and create well-rounded and upscale looking containers. When selecting the planter, pay attention to the color, as this is the foundational piece drawing all of the colors together. 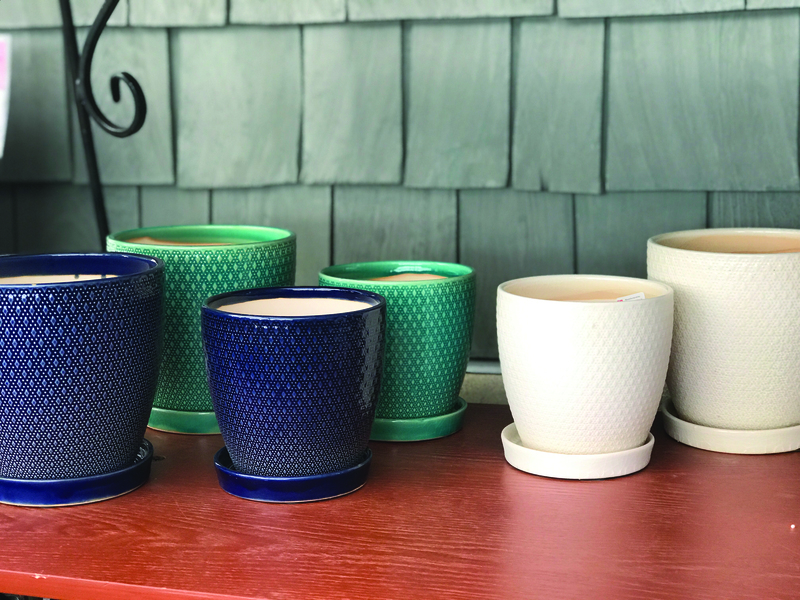 For ideas, Ferguson’s has the largest selection of pottery in the area from terra cotta to resin to glazed, to high quality plastic. The staff can help a customer put together the right combinations of plants with a container. For best results choose a high quality potting mix and fertilizer appropriate to your plants. In the greenhouses, specific types of plants are placed together to make it easier for the customer to find. 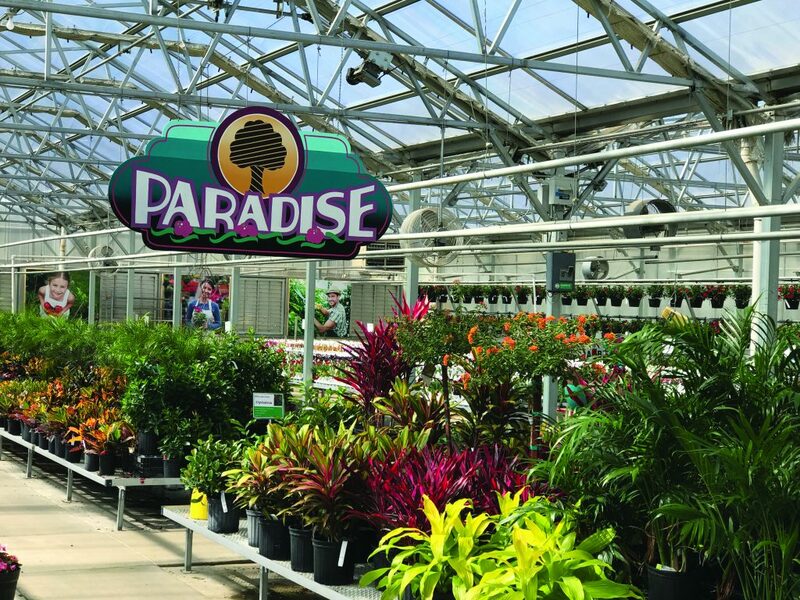 For instance, many tropical plants and annuals are located in the first greenhouse, Paradise. Once the frost is out and the temperature has warmed, trees, shrubs, and larger perennials are located in Ferguson’s outdoor garden area. “Our most popular perennials are the ones that bloom a long time and are easy care, such as daylilies, phlox, salvia, coneflowers,” Quance said. For endless flowers, plant a wide variety of perennials with various bloom seasons. Hanging baskets and planters provide color along the sides of the building and walls. Vegetables are in the middle building ready for the garden soil, while butterfly plants, native plants, and bee pollinators are grouped together for customer ease. Annuals are found throughout the main greenhouses, including a large selection of Proven Winner annuals. “This brand has been very successful for us and has proven to do well in our area,” Shupe said. She also said Dipladenia plants are an ideal plant for Okoboji, as they are drought tolerant and their shiny leaves easily handle the wind. 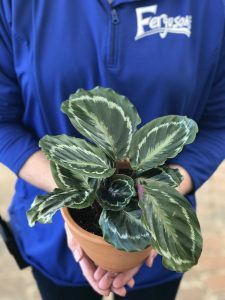 Because the Iowa Great Lakes area is in hardiness zone four, Ferguson’s works hard to bring in plants that will be successful with the temperature. In the greenhouse closest to the garden center, house plants of all sizes are available. Quance said succulents and cactus are some of the most popular plants right now, especially with younger generations. They have a low price point and are easy to take care of. 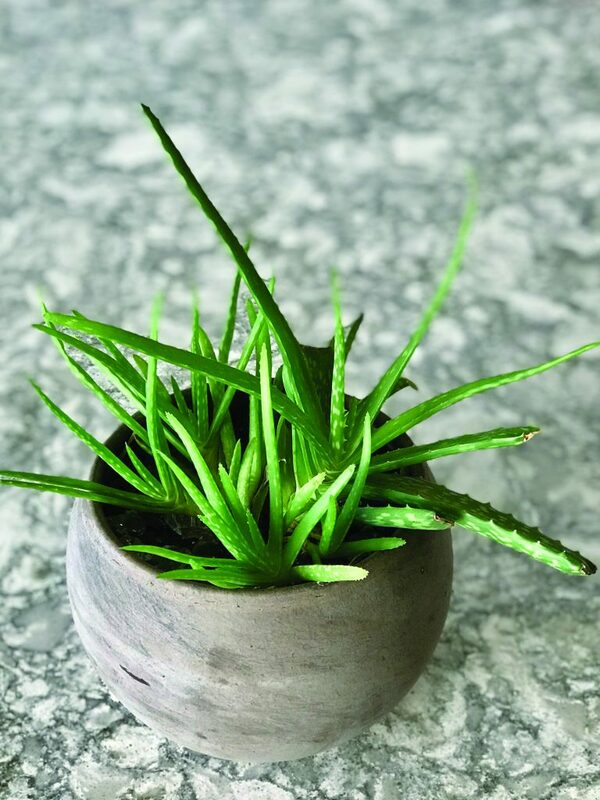 Other popular and easy to care for indoor plants are sansevieria, ponytail palms, and aloe vera. Some of Ferguson's favorites for their interesting leaves are, calathea, pothos, and polka dot plants. 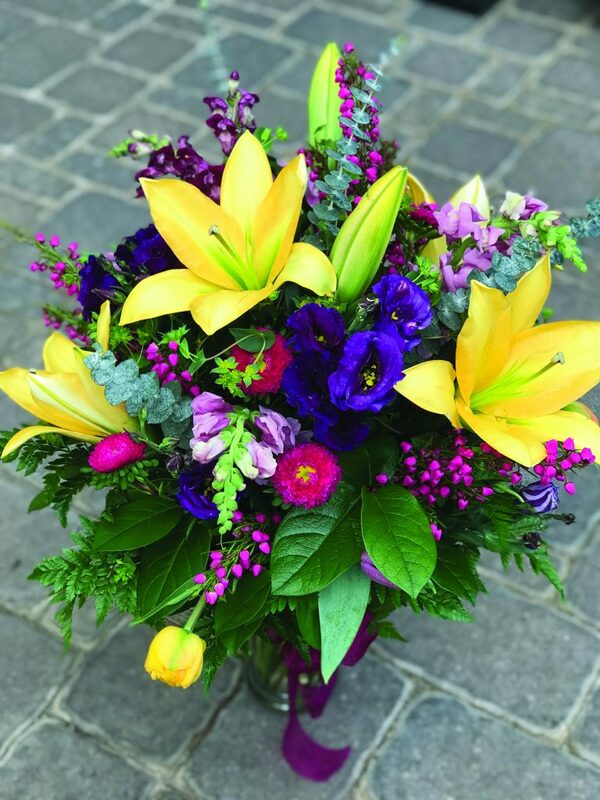 Ferguson’s Floral Center is located in the main building and provides gorgeous floral arrangements for weddings, sympathy, and everyday needs. “Our floral designers are incredibly talented with all floral arrangements – sympathy, bridal, silks, and everyday arrangements,” Quance said. 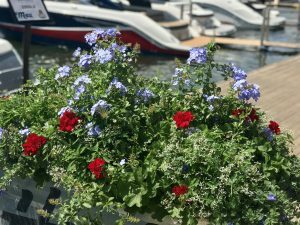 For many customers around the Iowa Great Lakes area, Ferguson’s goes above and beyond by planting their custom planters and brings them directly to their door. For an extra charge, they will water them by request and provide care. At the end of the season, Ferguson’s staff will go pick up the planters and will store the pots until next season. This protects the pots from winter weather. Ferguson’s also plants customer’s planters at their home or business once the weather warms up. Ferguson’s offers its customers countless workshops and seminars throughout the year. Each class is different, whether it’s a make and take class, planter design class, or a seminar. The classes are short and usually come and go. A gardener can come and learn the best way to design a planter or come to a make and take succulent workshop. Classes are regularly listed on Ferguson’s Facebook page and website. “We love to be able to talk to the people who come to the classes,” Shupe said. On April 20, Ferguson’s Garden Center will host its Spring Open House. There are creative and informative classes planned, treats, and a children’s activity. They will also be having an Earth Day celebration on April 27. To find more information on these two events and other upcoming events, specials and gardening tips follow them on Facebook - @fergusons.gardens. Ferguson’s Garden Center is a family-owned gardener’s haven, located along Hwy 71 and under the giant shade tree. 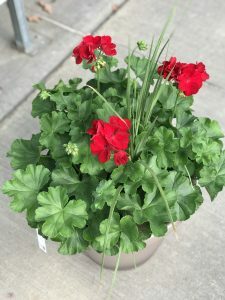 For gardening advice, visit www.fergusonsgardencenter.com or call (712) 336-2085. The Ferguson’s staff is filled with green thumbs and design skills used to beautify the Iowa Great Lakes area.